Looking at the download statistics for my WordPress Plugin Blog-in-Blog, (over 15,000 downloads so far whooo!) 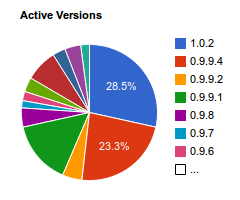 I see that WordPress is now giving me a breakdown of which versions are still out and running in the wild. This is interesting. Most people are using a more up-to-date version – but only just. I wonder if the picture reflects a quarter of internet users who are always (perhaps obsessively) updating their plugins; a quarter who regularly update their plugins, and the rest who may or may not update plugins. There’s actually probably a hundred and one reasons why people aren’t using the latest version. If it’s because you are having issues with a new version, then let me know and I will fix it! This entry was posted on Wednesday, October 27th, 2010 at 8:34 pm	and is filed under Updates. You can follow any comments to this entry through the RSS 2.0 feed. You can leave a comment, or trackback from your own site. I just want to thank you for you awesome Blog in Blog plugin, it was the ideal solution to the problem that I was having with my customized WordPress template. This plugin is really easy to understand, use and implement in my WordPress blog, I can’t thank you enough. I haven’t donated yet is because I don’t have a PayPal account, but I am considering joining PayPal soon and when I do I will send some donation your way. Happy Holidays! Sir, I have using blog in blog plugin for my website. I’m using version 3.1.3 of wordpress. But it seems some problems, please help me out. I have created a page(named “php”) and a category(named ‘php_ajax’) and I have added the sortcode to the page is “[blog_in_blog category_slug='php_ajax' num=10]“. Also I have chang the “%post_content%” to “%post_excerpt%”, this worked well except one. This is the hyperlink of the “more>>” is wrong. Suppose I have a post (title xyz) in the page “php”, so the hyperlink of the “more>>” of the corresponding post should be “http://localhost/wordpress313/xyz/#more-8” but it shows “http://localhost/wordpress313/php/#more-8”, which is wrong. So am I miss something? Hi I think this is going to be filed as a Bug. Thanks for pointing it out. Why has this not been tested for the newer versions of WordPress? I am using it in 3.5.1 and love it. I am nervous about upgrading to 3.5.2 because I want to make sure that all my plug-ins will work. Your’s is one I want to preserve. I constantly see people asking questions about how to do what your plug-in does. If this works with 3.5.2 and I’m not broken hearted (because I’ve just started within the last two months and am still working on getting it the way I want) I will send a well-deserved donation. I just wish I could donate what it is worth. It works fine if _term_taxonomies.term_taxonomy_id and _term_taxonomies.term_id have identical values, what can happend, whyever. But it can also happened, that they are not identical, whyever. Sorry for my bad english and thank you for that plugin!